We’re doing a three-part series on how to make your art show or new launch a success! In the first post, we talked about what you need to do before opening night. Check it out here, and look for the last article on wrapping up your event to be published next week! 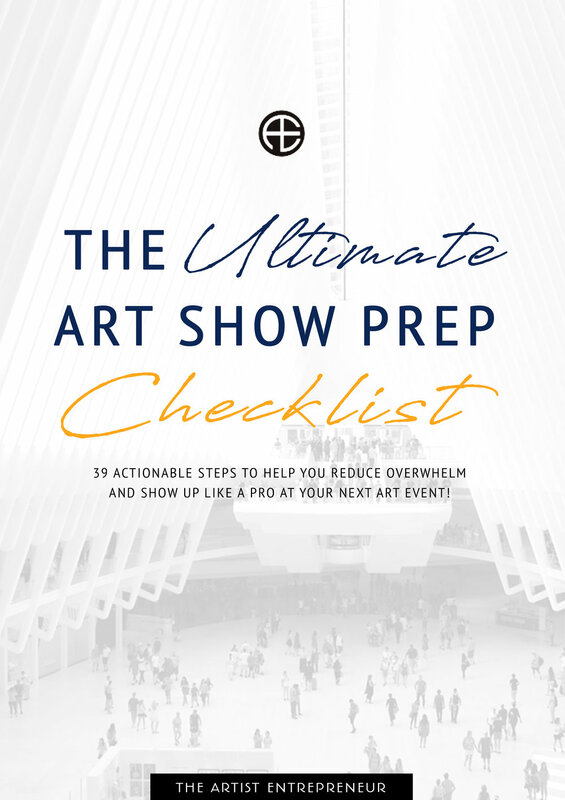 We have also created a complementary Ultimate 39 Step Art Show Prep checklist thata yuou can get here. Once your art pieces have been installed, the invites have gone out, and opening night is just a few short hours away, it seems like all the “hard” work should be over, right? Nope! Don’t rest on your laurels now. There’s more to do if you want your show or launch to be a success. Now that everyone is due to arrive for your party, would you duck out and leave your friends to amuse themselves? No! You’d be right there, making introductions, urging someone to try the artichoke dip, chatting up a storm, and making sure the event goes smoothly. Your art show or collection launch is really no different. Once your event has kicked off, engagement with your guests and potential guests should be your number one priority. 1) Make your artist’s bio, statement, and any other materials that support your credibility as an artist available during the event. People don’t buy artwork, they buy the emotions that artwork inspires in them. There’s a wide range of emotions that can apply here—maybe the piece you’ve created reminds them of a cherished memory, perhaps your story intrigues them and they want a piece of your story in their lives, or perhaps they feel like owning your artwork gives them status among their friends. Regardless of the reason, having your materials available will help reinforce the story they are telling themselves in their heads. 2) Greet and engage every visitor who walks through the door. I know, I know, you don’t want to be too “salesy” now that your show has opened. Many artists I’ve coached are afraid of being seen as pushy and as a result don’t talk to people enough, or avoid them altogether. Don’t think of your conversation as a “sales” push, think of it as getting to know the person in front of you, learning what they like and dislike, and serving them by figuring out which of your pieces would appeal to them most. And don’t forget to have an email list sign up handy so that you can follow up with them after the show! 3) Keep the event momentum going after opening night. Once the energy of opening night has faded away, it’s tempting to believe you have nothing left to do. But your pieces don’t mysteriously disappear! Just because someone couldn’t make it at a particular date and time doesn’t mean they won’t make the effort to see your work on another day. Remind your fans and collectors through social media posts and emails that your show is still up or your launch is ongoing, and look for fun, innovative ways to keep interest high—like hosting events or releasing special “behind the scenes” information. I know it can be daunting to push yourself out of your comfort zone and keep the conversation going. But by implementing these suggestions, your chance of feeling like your show or launch is successful and profitable is much higher.